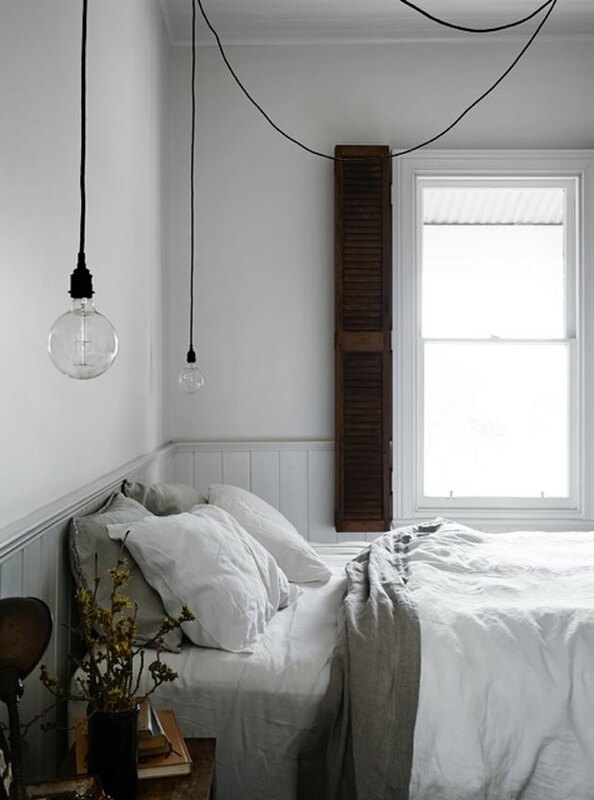 Minimalist design has been all of the rage lately, but there's always room for some classic farmhouse bedroom ideas. This beloved rural style inspires relaxation and comfort, no matter where you're located in the world, which is perfect for the space where you start and end each day. You could be smack-dab in the middle of New York City's hustle and bustle, but when you deck out your room in this bucolic aesthetic you'll feel like you're waking up in the middle of the countryside. Here are 13 ideas to help you create the farmhouse bedroom of your dreams. 1. Classic white walls make a great backdrop. 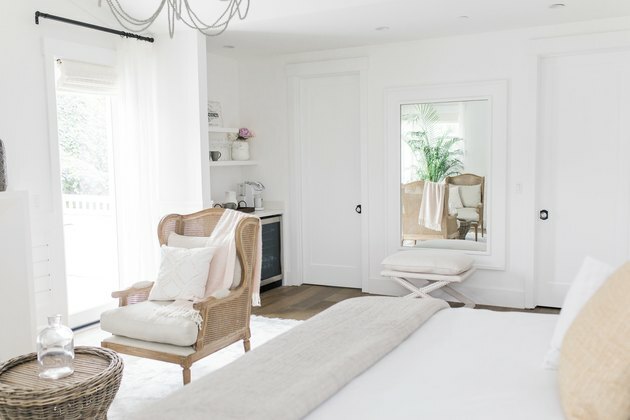 While you certainly can paint your farmhouse bedroom walls in any color you desire, there's something so deliciously chic about an all-white palette. 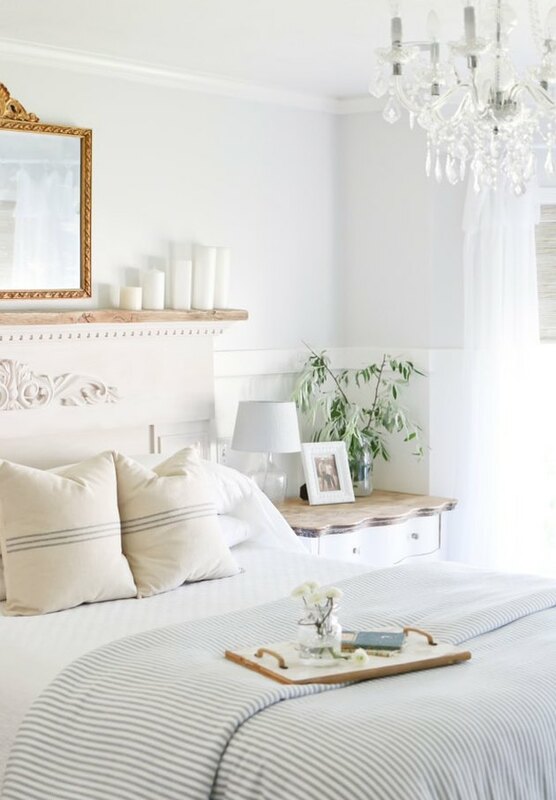 The charming rustic details in former Bachelorette Ali Fedotowsky's airy bedroom really stand out thanks to the simple backdrop. 2. Rustic ceiling beams are a must. 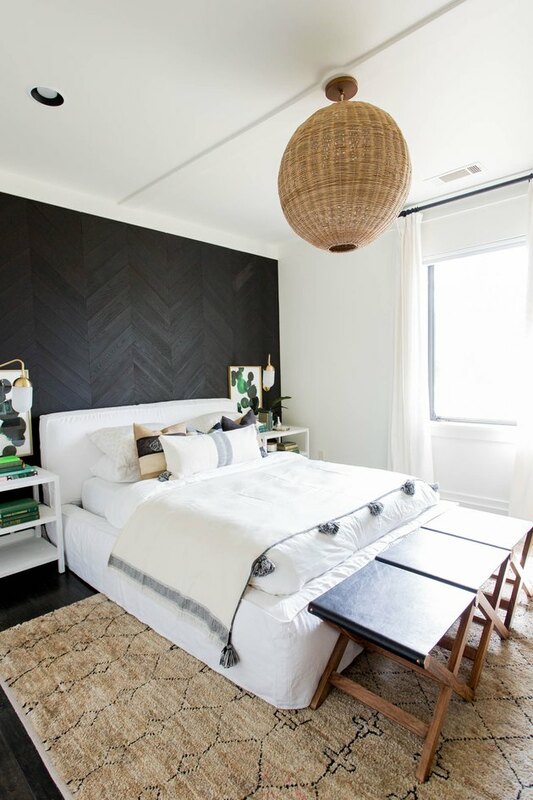 credit: Jenna Sue Design Co.
One farmhouse bedroom idea that's always a classic: wood ceiling beams. If your home already has them, perfect! But if not, you can challenge yourself to a DIY project and add decorative ceiling beams. They're a great way to frame your space and add beautiful rustic detail as seen in this bedroom designed by Jenna Sue. 3. Weathered accents add character. There's a time and a place for weathered furniture — and a farmhouse bedroom is the time and the place. 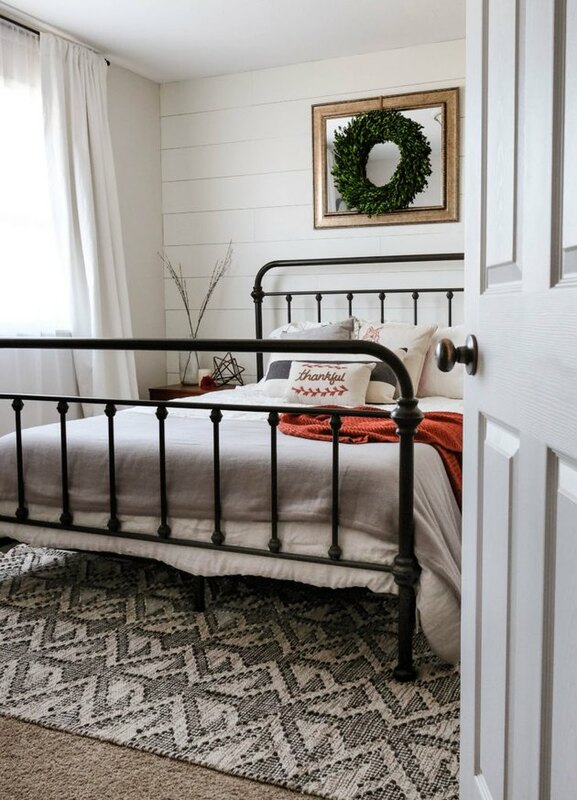 Lauren from Bless'er House took took this farmhouse bedroom idea to heart and gave her bed a rustic makeover with a clever DIY project. 4. Bring a bit of the Wild West indoors with lush greenery. The glory of a farmhouse is its unique connection to nature. Add a pop of color with leafy plants and vibrant succulents like Ashley from the Little Glass Jar to mimic that earthy feeling in your bedroom. 5. Industrial touches are oh-so-complementary. Just because you're decorating a farmhouse bedroom that doesn't mean you have to leave industrial style behind. The two aesthetics blend happen to blend perfectly. 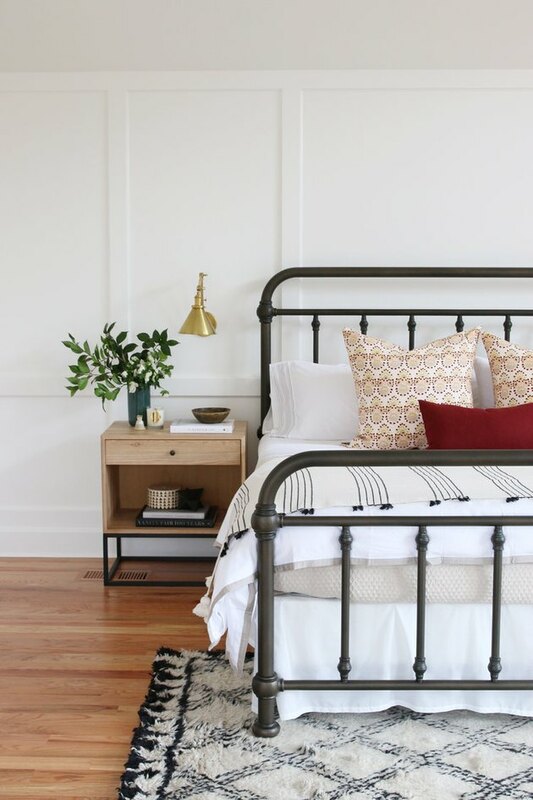 Thanks to interior designer Shea from Studio McGee, this bedroom's metal bed frame and brass wall sconces mesh beautifully with the rest of its rustic decor. 6. Spruce things up with a few glam accents. 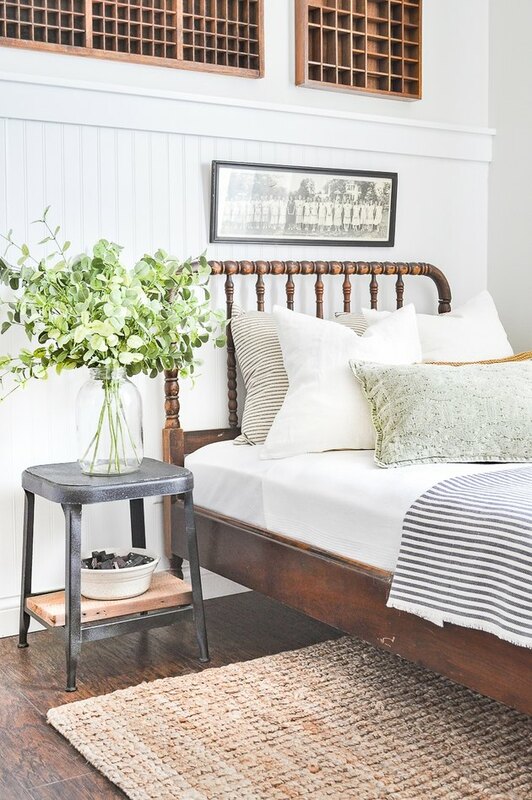 One farmhouse bedroom idea that often goes overlooked: glamour. Pair rustic-inspired furniture with a glamorous crystal chandelier and a gilded mirror à la Cami from Tidbits' master bedroom. 7. Give shiplap walls a try. Have you been admiring Joanna Gaines, just waiting for an opportunity to cover a wall in shiplap, too? Well your farmhouse bedroom is the perfect opportunity. Ashley over at Joyfully Growing has a white-painted shiplap accent wall in her master suite and it feels just like a rustic retreat. 8. Or, opt for board and batten. If shiplap is not really your cup of tea, give board and batten a try instead. 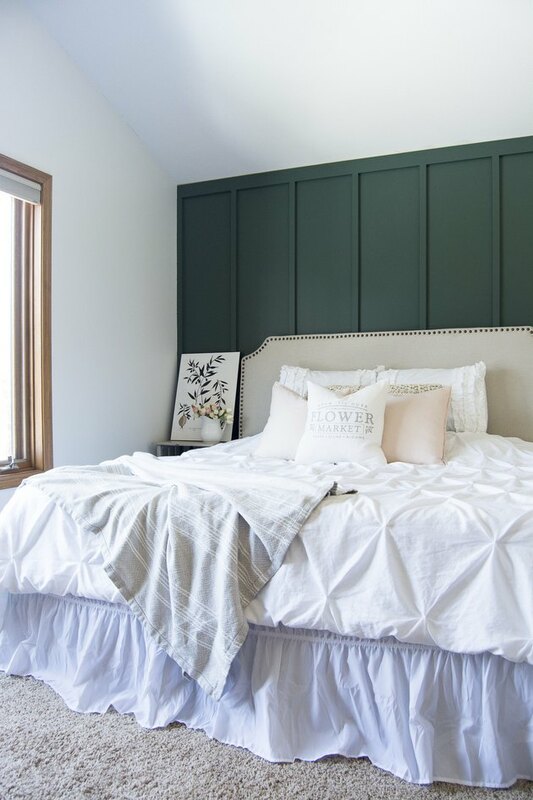 Sarah from Grace In My Space DIYed this striking green accent wall in her farmhouse master bedroom, and we are swooning. This bedroom probably wasn't plucked out of a scene from Laura Ingalls Wilder's Little House on the Prairie, but it still manages to capture a hint of farmhouse charm. 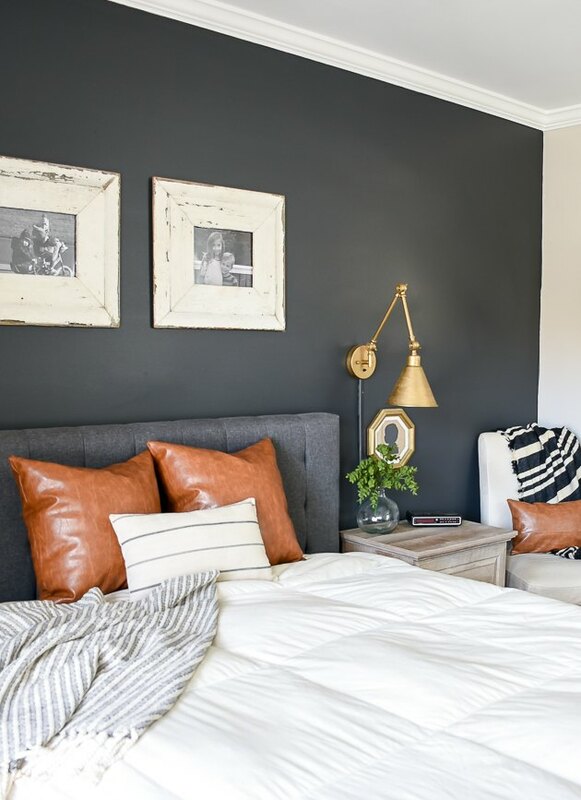 Katie from Little House of Four infused western accents such as faux leather pillows and weathered picture frames into her master bedroom to create a modern yet subtly rustic vibe. 10. Create a layered look with gorgeous textures. 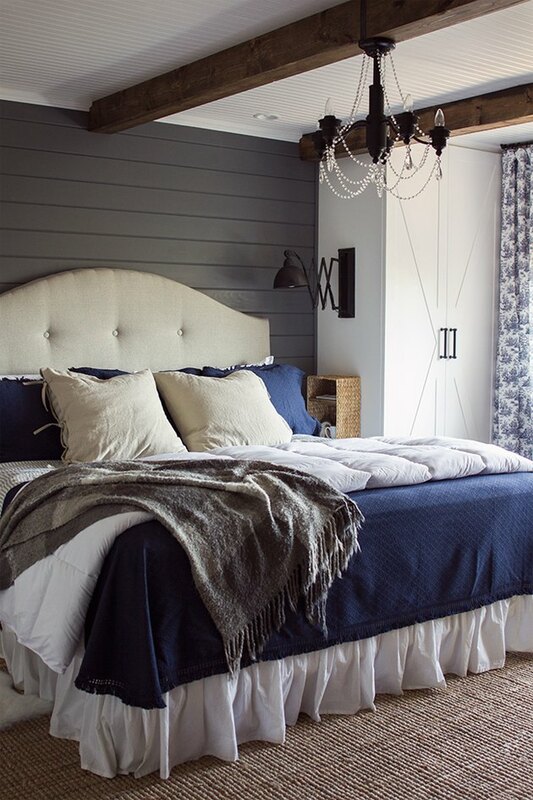 DIY enthusiast Dale Marie created a stunning layered look in her farmhouse bedroom thanks to a variety of different textures. 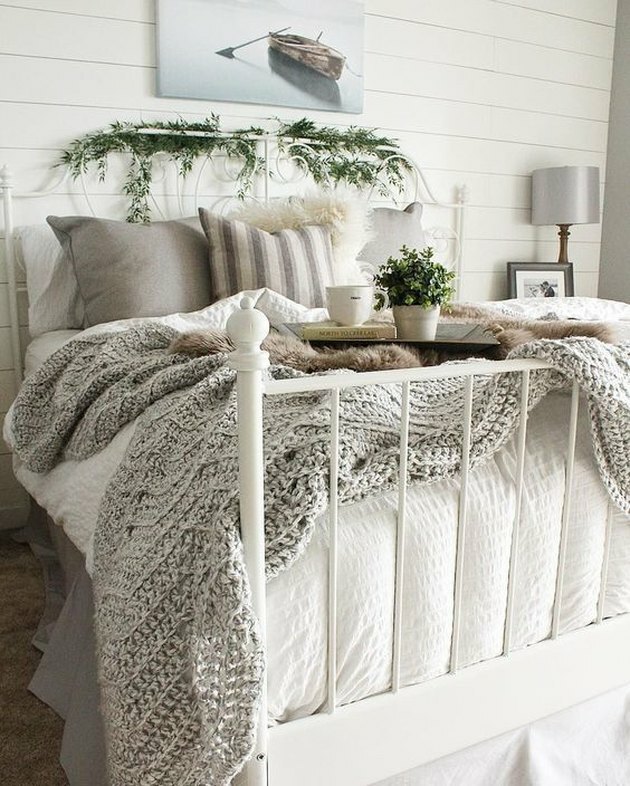 From the greenery hanging on the headboard, to the handmade knit blanket, to the faux fur throw, this bed situation was made for sweet dreams. 11. Carve out a charming reading nook. While away your lazy farmhouse days in a comfy, cozy reading nook. 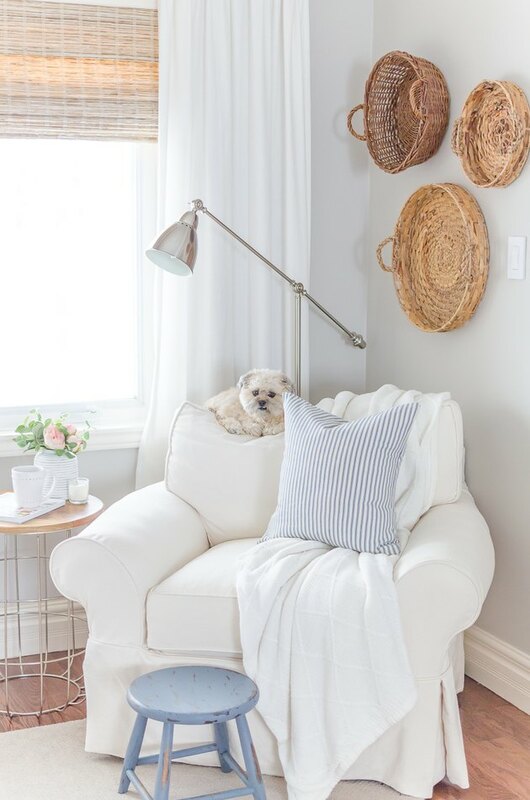 Follow Alicia over at A Burst of Beautiful's lead and move your fave lounge chair next to a sunny window and drape a soft, luxurious throw over it for the ideal afternoon escape. 12. Mix modern and rustic inspiration. Don't be afraid to mix and match styles, too. Interior designer Kathleen Walsh did just that in this alluring farmhouse bedroom that marries minimalism with rustic details for a picture-perfect end result. 13. Warm up the floors with an area rug. 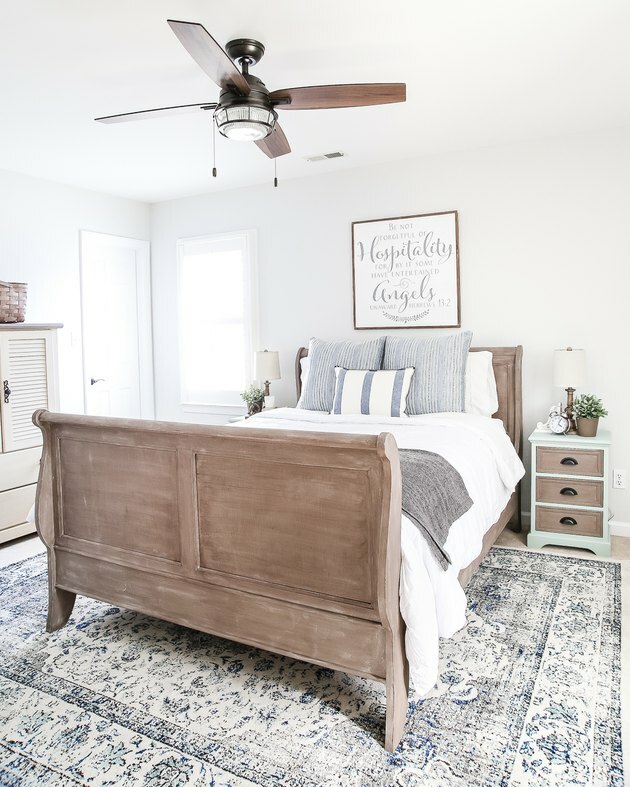 Last but not least, an area rug is a great way to warm up the floor (and the feet) in a farmhouse bedroom. And like this striking space designed by the team at Design Shop Interiors, it also adds a layer of cozy color and texture.